This toffee is one of the most popular things we make here at the 1802 House Bed and Breakfast. It is a buttery, nutty, chocolatey bit of pure indulgence. And so simple to make! We’ve sent this recipe home with more guests than any of our others. We even had one guest break it up, put in homemade ice cream and win her daughter’s “Homemade Ice Cream” contest at their local school! It’s a great holiday gift idea as it’s easy to make and stores well. We use almonds when we make this for our guests because they’re my favorite nut. I love almonds with chocolate. You could use any nut that you prefer though. Macadamia works very well too. We also think that good quality chocolate is important. Ghirardelli semi sweet chocolate chips are our favorite. You could use their bitter sweet or milk chocolate as well. It’s really down to personal preference and tastes. The “how-to” remains the same. You will need a candy thermometer and a heavy bottom pan. Clean up is easy. Just soak in hot soapy water. Be careful when working with the hot melted butter and sugar. Preheat oven to 350F. Spread plain whole almonds over a regular sized cookie sheet and roast for 10 minutes, shaking frequently. Keep an eye on them so they don't burn. Remove from oven and set aside. In a heavy bottom saucepan, add the sugar, butter and water. Set your candy thermometer in the pan. Bring the ingredients to a boil on a medium-high heat. Continue to boil, shaking the pan once or twice to mix the ingredients. You want to continue to boil gently until the mixture reaches 300F and turns a light caramel color. Working quickly (and carefully), remove from heat and add the nuts and baking soda. Stir well and pour onto your cookie sheet. Smooth out until the entire sheet is covered. Sprinkle the chocolate chips over the hot toffee and let sit for 5 - 10 minutes to melt. Using a flat pastry knife, smooth the melted chocolate over the surface to cover all of the toffee. Evenly sprinkle the roughly chopped salted almonds over the surface of the chocolate. Press in lightly with palm of your hand so that they are set in the warm chocolate. Set the toffee aside until the pan is cool. Then put in the refrigerator for 20 minutes to set the chocolate. Remove toffee from refrigerator and tip out onto a clean surface. 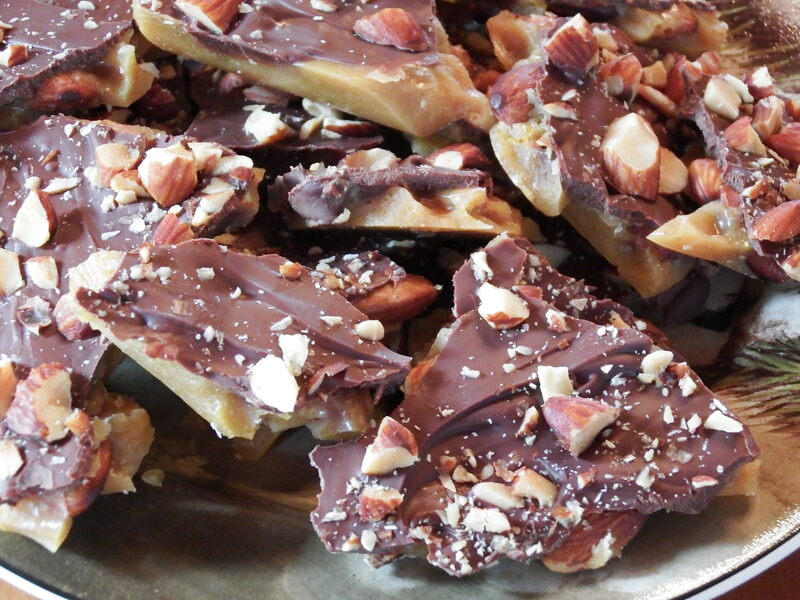 Gently break the toffee into pieces and store in an airtight container for up to one week.